This tapestry 'Panel of Tiles' is based on a work by William Morris of 66 hand painted tiles, and produced by William De Morgan in 1876. This work features William Morris' favourite motif of the acanthus leaf as well as daisies and numerous other small flowers. The violet blue and olive colored leaves are set against a contrasting black background. 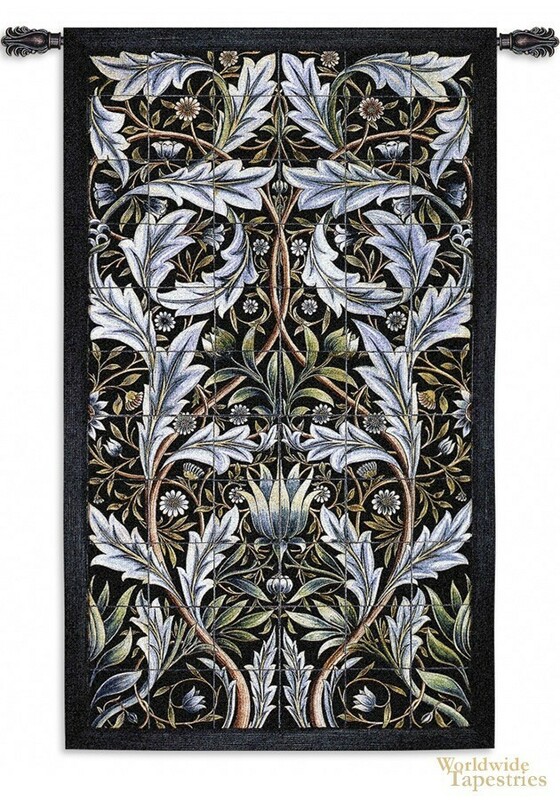 This portiere style tapestry is a work that has all the typical hallmarks of a Morris piece. William Morris and Co was responsible for the revival of the arts and crafts world in England in the age of industrial revolution in the Victorian era. He and his company produced many iconic works featuring either natural or mythical elements in his designs. In this work, the icons from nature are showcased in a pattern which evolves from bottom to the top of the design. This tapestry is backed with lining and tunnel for easy hanging. Note: tapestry rod and tassels, where pictured, are purchased separately. Dimensions: W 31" x H 53"